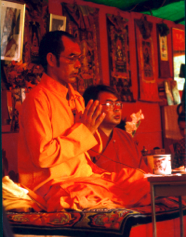 La Castillanderie, 1984 — Rigpa's international summer retreat in France entitled Awakening the Buddha Within which took place from the 4th to the 26th of August at La Castillanderie in the Dordogne with Kyabjé Dudjom Rinpoche and Sogyal Rinpoche. The retreatants also went to La Sonnerie to receive teachings on Longchen Nyingtik guru yoga from Kyabjé Dilgo Khyentse Rinpoche and to Laugeral to receive further teachings and empowerments from Dudjom Rinpoche. 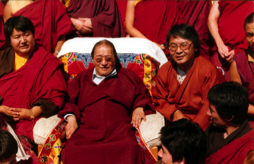 From the 6th to the 12th of August, at Laugeral, Dudjom Rinpoche taught on View, Meditation and Action (using verses from the Le'u Dünma prayer) and gave the empowerments of Orgyen Menla (Guru Rinpoche of Medicine) and Green Tara of Wealth. Dilgo Khyentse Rinpoche taught during the second period of the retreat and the last week was planned as a time for practice. Khandro Tsering Chödrön also attended, as did Dr Trogawa Rinpoche. Shechen Rabjam Rinpoche visited; Nyoshul Khen Rinpoche taught the Rigpa sangha for the very first time and Shenphen Dawa Rinpoche also gave teachings on Dzogchen and the practice of Vajrakilaya.